Do Hedge Funds Love Tidewater Inc. (NYSE:TDW)? We know that hedge funds generate strong, risk-adjusted returns over the long run, therefore imitating the picks that they are collectively bullish on can be a profitable strategy for retail investors. With billions of dollars in assets, smart money investors have to conduct complex analyses, spend many resources and use tools that are not always available for the general crowd. This doesn’t mean that they don’t have occasional colossal losses; they do (like Peltz’s recent General Electric losses). However, it is still good idea to keep an eye on hedge fund activity. With this in mind, as the current round of 13F filings has just ended, let’s examine the smart money sentiment towards Tidewater Inc. (NYSE:TDW). Is Tidewater Inc. (NYSE:TDW) a first-rate investment right now? Prominent investors are taking a bullish view. The number of bullish hedge fund bets advanced by 2 in recent months, and the company was in 11 hedge funds’ portfolios at the end of September. Still, that number wasn’t even close for the company to be considered as one of the 30 most popular stocks among hedge funds in Q3 of 2018. 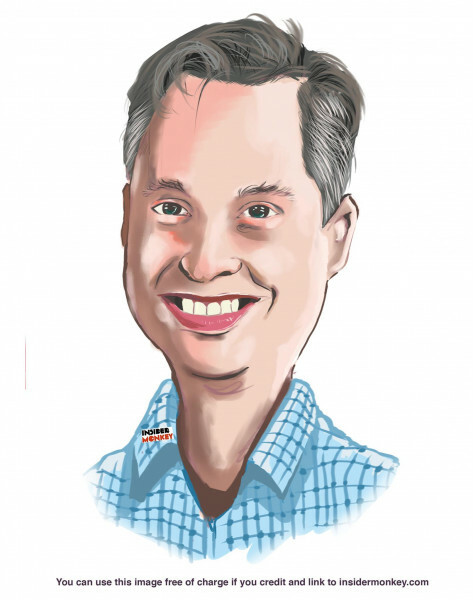 While researching about the stock further, we tracked Third Avenue Value Fund’s Portfolio Manager Commentary, in which this open-ended equity mutual fund talks about the latest company’s business moves. We bring you that part of the letter. In today’s marketplace there are dozens of formulas market participants can use to appraise their holdings. A pair of the most useful formulas are hedge fund and insider trading indicators. Our researchers have shown that, historically, those who follow the best picks of the top fund managers can beat their index-focused peers by a significant amount (see the details here). We’re going to review the new hedge fund action surrounding Tidewater Inc. (NYSE:TDW). What have hedge funds been doing with Tidewater Inc. (NYSE:TDW)? At Q3’s end, a total of 11 of the hedge funds tracked by Insider Monkey held long positions in this stock, a change of 22% from the second quarter of 2018. 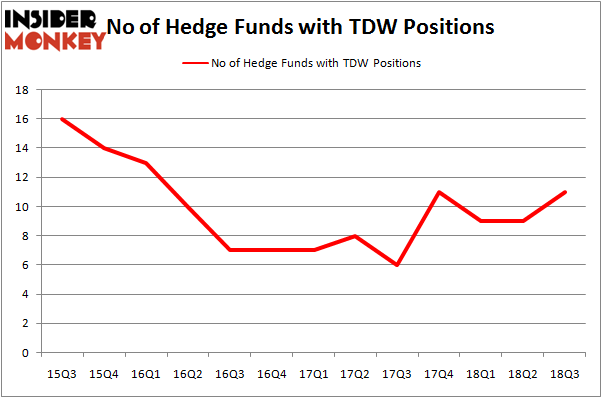 The graph below displays the number of hedge funds with bullish position in TDW over the last 13 quarters. With the smart money’s sentiment swirling, there exists an “upper tier” of notable hedge fund managers who were upping their holdings significantly (or already accumulated large positions). More specifically, Third Avenue Management was the largest shareholder of Tidewater Inc. (NYSE:TDW), with a stake worth $69.8 million reported as of the end of September. Trailing Third Avenue Management was DC Capital Partners, which amassed a stake valued at $5.5 million. Solus Alternative Asset Management, Two Sigma Advisors, and Marshall Wace LLP were also very fond of the stock, giving the stock large weights in their portfolios. As aggregate interest increased, key hedge funds were breaking ground themselves. Marshall Wace LLP, managed by Paul Marshall and Ian Wace, established the most outsized position in Tidewater Inc. (NYSE:TDW). Marshall Wace LLP had $1.9 million invested in the company at the end of the quarter. Jay Petschek and Steven Major’s Corsair Capital Management also initiated a $1.9 million position during the quarter. The other funds with brand new TDW positions are Joel Greenblatt’s Gotham Asset Management and Paul Tudor Jones’s Tudor Investment Corp.
Let’s now review hedge fund activity in other stocks – not necessarily in the same industry as Tidewater Inc. (NYSE:TDW) but similarly valued. We will take a look at Blackrock MuniYield Quality Fund III, Inc. (NYSE:MYI), Addus Homecare Corporation (NASDAQ:ADUS), Byline Bancorp, Inc. (NYSE:BY), and Community Trust Bancorp, Inc. (NASDAQ:CTBI). All of these stocks’ market caps are similar to TDW’s market cap. As you can see these stocks had an average of 9 hedge funds with bullish positions and the average amount invested in these stocks was $24 million. That figure was $89 million in TDW’s case. Addus Homecare Corporation (NASDAQ:ADUS) is the most popular stock in this table. On the other hand Blackrock MuniYield Quality Fund III, Inc. (NYSE:MYI) is the least popular one with only 3 bullish hedge fund positions. Tidewater Inc. (NYSE:TDW) is not the most popular stock in this group but hedge fund interest is still above average. This is a slightly positive signal but we’d rather spend our time researching stocks that hedge funds are piling on. In this regard ADUS might be a better candidate to consider a long position.